Gondolas are without doubt the symbol of Venice. The icon of this most iconic city. Hence, every time that I go there (quite an affordable luxury, really, as Vicenza is only a 40 minutes train ride away), I get the urge to snap as many gondolas as I can. And I don’t fight it. Gliding majestically up and down the narrow and wide canals, ruled over by gondoliers in stripey tops, gondolas are truly a sight to behold. They are made of hundreds of parts and eight different types of wood: oak, pine, elm, cherry, larch, walnut, basswood and mahogany. Although you would never guess it just by looking at them. For their black elongated body seems so perfectly cohesive like it has been drawn on top of the Venetian waters with one smooth swirly movement by the skilled hand of an artist. Nor would you guess that gondolas weigh about 350 kg each! They move so elegantly and smoothly thanks to the skills of a man whose father and grandfathers have been guiding gondolas up and down Canale Grande for centuries. My favourite spot for gondola photography is the gondola station at St. Mark’s square (right in front of the two pillars crowned by the winged lion of Venice and a statue of St. Theodore with a crocodile to represent the dragon slayed by the saint). This is where a great view opens to the basin of St. Mark’s – an expanse of water bordered by some of Venice’s most famous sights. 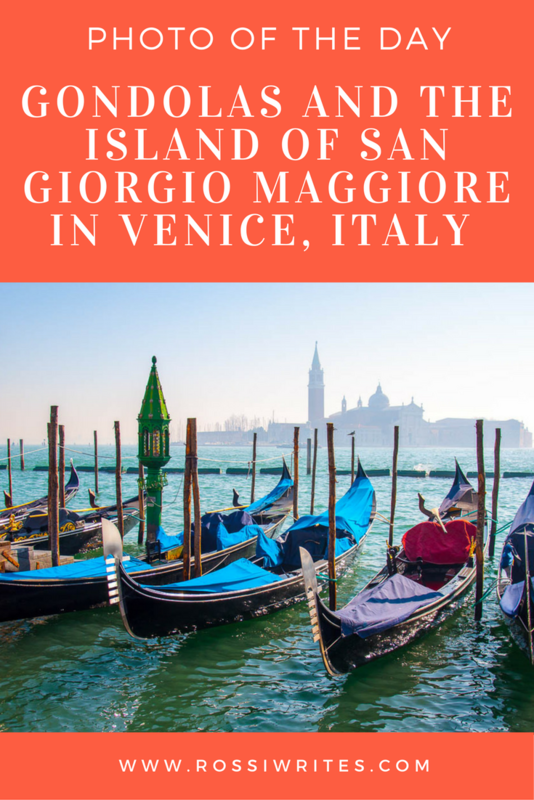 At its other end stands the tiny island of San Giorgio Maggiore crowned by a 16th-century church of the same name which is one of the architect Palladio’s masterpieces. I took this photo on a misty yet sunny day. The sun shone bright on the traditional blue covers of the gondolas, which, tied to their wooden poles, splish-splashed in the water. The San Giorgio Maggiore island was covered by a light mist, so that only its recognisable outline could be glimpsed. I waited patiently for all the watercraft traffic (vaporettos, car ferries and Venetian boats of all shapes and sizes) to clear the space between the gondolas and the island and I clicked the shutter. Do you share my appreciation for gondolas? What is the most memorable photo of a gondola you have taken yourself? This post is part of my new series of blog posts. Called ‘Photo of the Day’ I use it to share with you (fingers crossed, daily) a photo which reveals the beauty and the reality of living in Italy and travelling in Europe. These are short posts (sometimes more of a caption, really), so that you can enjoy them on the go and use them to bring a ray of colour into each of your days. If you liked what you read, please, leave me a comment or use the buttons below to share it on social media. I expect you know the live webcams of Venice? Fascinating to watch from time to time. Sadly the one in front of St Marks has been discontinued. It used to be interesting to watch high tide in real time, with the walkways set up above the water, and people splashing about in front of the basilica, with the bells clanging. No, I actually don’t think I have ever watched a Venice webcam. Thank you for mentioning it. In any case, the water in Venice always looks so tempting, but as far as I know it is strictly advised not to swim/splash in it, as it is not really clean. Aqua alta can be both terrifying and totally captivating. The speed with which the water comes up and floods the streets is amazing.